As a dog owner, it’s only natural to want to ensure that your dog is safe, healthy, and happy at all times. Seeing them in pain can be absolutely heartbreaking, of course, we want to help ease their discomfort. But what can you give them? Can dogs take medication like Advil or Aspirin? When your dog is in pain, you might be tempted to open the medicine cabinet and feed them an over-the-counter pain reliever. After all — it’s completely safe for you so your dog should be fine too, right? The most common types of over-the-counter pain medications are known as NSAIDs — or non-steroidal anti-inflammatory drugs. They are easy to attain and located in almost every household. But is it safe for your dog? 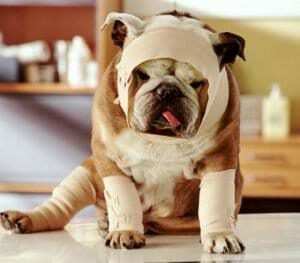 1 Can you give a dog aspirin? 2 Can Dogs Take Advil? The short and simple answer to this question is NO. Aspirin is completely toxic for your dog — no matter the size or breed. Instead of healing or helping your dog, giving your dog aspirin will cause the exact opposite reaction. If all of this wasn’t terrifying enough, aspirin can also damage the cartilage in your dog’s joints causing pain that you were trying to treat in the first place. Dogs with osteoarthritis should never be given aspirin. Given all of this information, you should always consult with your veterinarian. It has been said that buffered aspirin — or aspirin with a coating or a shell — can be given to your dog in low and monitored amounts. This will need to be decided by your veterinarian. Advil is another over-the-counter NSAID pain reliever — Advil is the brand name while the drug name is generically known as ibuprofen. When it comes to administering ibuprofen to your dog, the same basic rules and conditions as aspirin will generally apply. As mentioned earlier, the buffered version of aspirin can sometimes be given to your dog under the guidance of a veterinarian. The same, however, does not apply to ibuprofen. This medication has a very narrow margin of safety. Ibuprofen is even worse and more dangerous for your dog than aspirin. As with aspirin, ibuprofen can cause stomach ulcers, kidney issues or failure, and even death. It is advised to never give your dog ibuprofen. What were to happen if you gave your dog ibuprofen or aspirin without having this knowledge? Or what if you came home to find that a bottle of medication had spilled on the floor and your dog ingested it? How can you spot the symptoms of NSAID poisoning? The most vulnerable areas of the dog when it comes to NSAIDs is their effect on the digestive system. This is where you will notice most, if not all, symptoms or side effects. Look out for vomiting or diarrhea as the first tell-tale signs — there could even be blood in either. 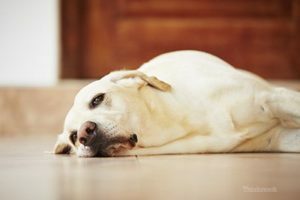 If your dog has NSAID poisoning, they will need to be treated right away. Take your dog to the veterinarian right away if you suspect that your dog has ingested Advil, aspirin, or any other NSAID. They will need to begin treatment right away. If your dog were to be poisoned by NSAIDS, the cost of treatment can be devastating. Mild to moderate exposure to NSAIDs could typically result in a $1000 vet visit. If the exposure was more severe, the expenses can run up to $1000 a day. All of which could have been prevented. Thankfully, NSAID poisoning is 100% preventable. It’s important as pet owners to make sure that medications of all kinds are kept up and away from any children or pets. Be sure to always keep medications in their properly labeled containers to prevent any confusion or accidental ingestion. It should be evident by now that Advil, aspirin, or other NSAIDs are not an option for pain management or treatment for your dog — no matter the size or breed. So, what can you do for pain treatment? No one wants to see their dog suffering to any degree. Many chronic pain conditions, such as arthritis, can often be treated with a dietary and physical activity change. Foods with high levels of omega-3 fatty acids have been shown to reduce joint inflammation and muscle pain. Overweight dogs can often suffer from joint pain — resulting to a low-calorie dense diet can greatly reduce body mass and in turn decrease stress on your dog’s joints as well as lessen inflammation throughout their body. Severe pain can often be treated through physical therapy, laser treatments, acupuncture, and other therapies. These treatments can often time eliminate the need for any pain medications. 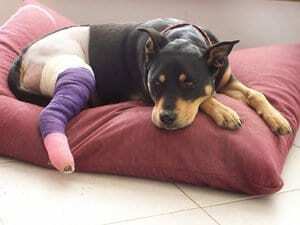 If you sense that your dog is in pain or discomfort — seek guidance from your veterinarian right away. They may recommend a new diet and exercise plan or they may insist on a more intense physical therapy treatment. Can dogs take Advil or aspirin? No! Keep your dogs safe and healthy by giving them a proper diet, plenty of regular exercise, and eliminate their exposure to any medications within the household.